Once a year, Pioneer Public Television works very hard to retain current members and encourage new members by offering a membership pledge drive. This year, Pioneer gave the communities they serve the opportunity to feature their community during the drive. Volunteer members of the communities took membership calls in order to help Pioneer reach their goal. 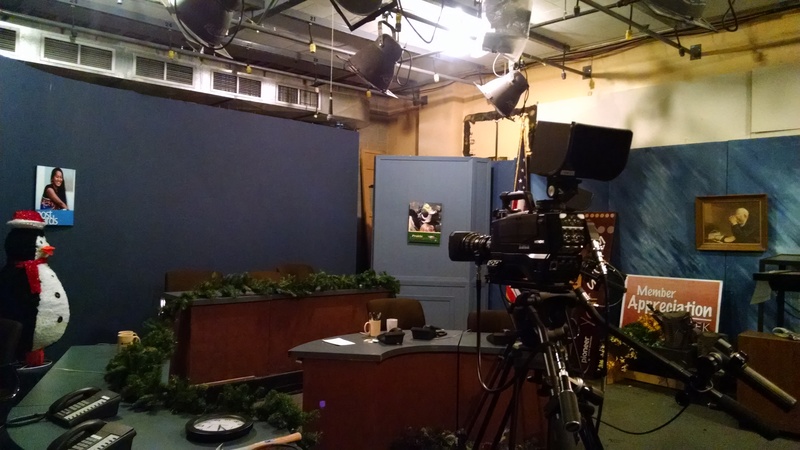 Pioneer Public Television is celebrating its 49th year of broadcast operation with a Community Pride Membership Drive, February 28th through March 18. Pioneer has a goal of raising $60,000 during the course of the drive in the form of new and renewing memberships. The funds are used to pay for programs that are broadcast on the station’s 4 digital channels, 24 hours a day, 365 days a year. Featured communities include: Windom and the River City Eatery (Feb. 28), the Granite Falls Chamber of Commerce and Community Theater (March 1), Worthington’s Minnesota West Campus (March 3), theMontevideo Chamber of Commerce (March 8th), the Appleton Hospital and Chamber of Commerce (March 10), the Luverne Chamber of Commerce (March 14), Morris Chamber of Commerce and the Stevens Community Medical Center (March 15). The live membership drive programs will be held in the evenings during prime time broadcasts of special programming on Pioneer. “We have great supporters in many communities and this is a way to recognize and celebrate that support,” said President and General Manager Les Heen. Pioneer recently negotiated the expansion of its signal to the Dish Network satellite service serving the Twin Cities designated market area (DMA). With a signal reaching to counties in western Wisconsin on the east and to the Missouri River on the west, Pioneer has one of the largest geographic viewing areas of any PBS station in the nation emanating from one of the smallest towns in the PBS system. I was able to participate in the pledge drive with the Granite Falls community. It was very exciting to have the opportunity to be involved in such an event. Never being on live TV before, it seemed nerve racking until the lights hit. Everyone was very calm and understanding, it just felt natural. I was very lucky to be there with such wonderful, fun people which lightened the atmosphere. We all had a great experience taking calls and assisting Pioneer in reaching their goal. When our time ended, no one was in a big hurry to leave. We talked about how exciting it was to be a part of such a meaningful event like the pledge drive. I would recommend this volunteer opportunity to anyone. Many people came up to me days after telling me they saw me on TV, it was a great feeling knowing people I knew had tuned into Pioneer. We live in a world full of technology but keeping up with all of the technical terms can get frustrating. We just want to know what we have and what it means to us. Alongside price, speed is one of the key factors people talk about when it comes to choosing broadband. All of the internet service providers give you the broadband download speed. And then there are upload speeds, megabits and speed tests – but what does it all mean? – 4G stands for the fourth generation of mobile connection speeds, and is the first to bring broadband internet to the smartphone without being connected to WiFi. – 3G stands for the third generation of mobile connection technology, and is the second (after 2G) to support data as well as voice and SMS. – LTE stands for Long Term Evolution and is a form of wireless connection that represents a significant upgrade to 3G in terms of data speeds. – Broadband speed is measured in megabits per second, commonly written as Mb or Mbps (as in 2Mb, or 2Mbps). Make sure you don’t get confused between megabits and megabytes (which tends to be written as MB, or GB when referring to gigabytes) – these terms are memory capacity, not speed. its megabits per second (Mb) when talking about broadband speed, and megabytes (MB) – or gigabytes (GB) for large files – talking about file sizes and download caps. When you connect to the internet, the download speed is the pace at which data (websites, programs, music etc) is transferred from another source to your device. It’s the speed data (such as pictures and videos) is uploaded to the internet – perhaps to put onto a social networking site such as Facebook, or to a photo print ordering website.The upload is going in the opposite direction to the download – from your computer to someone else’s. – Internet speeds are not constant, so a connection that works well in the morning may be considerably slower in the afternoon. Another cause in internet speeds becoming slower maybe your computer. – More than likely you’re probably using a router. As routers age, they no longer correspond to the speeds that your service provider gives you. When the processor inside the router starts overheating, speeds get drastically slower. You’ll know this is happening to you if you get fast speeds after turning the router off for a few hours. But sometimes routers simply start failing without any other symptoms except a consistent slow speed. If you can find a spare router, test your speed on it. Perhaps it’s time you considered getting new router. – There are a couple of things to note with a broadband speed test: before you do a test, make sure you have closed any other applications using the internet such as email and instant messaging programs. Secondly, your broadband speed can vary wildly at different times of the day depending on external factors. If you want to know your average broadband speed you’ll need to do a series of tests at different times, as well as on weekdays and weekends. This is basically a box that goes between your internet modem and all of your internet devices (computers, HDTV, and so on). The router shares the internet signal between the multiple devices. The internet is evolving fast and it is not going away any time soon. Staying up to date with the latest information will help us evolve with technology and make our lives much easier. Wintercade Ice Fishing Contest is held on Lake Ripley each year in February. Wintercade is hosted by the Litchfield VFW & American Legion. This is a Veteran Appreciation fund raiser and proceeds from the ticket sales are donated back to the community. This year event will be held on February 21st, 2015. Television has come a long way since the early 1900’s which consisted of spinning discs and a neon lamp to give a blurry reddish-orange picture. Today we are watching digital programming from all over the world on many different devices and platforms. Even though there are hundreds of TV stations, we still have a hard time trying to find something good to watch. The syndicated news stations are talking about the cities or Florida but never about southwest or west central Minnesota towns. It would be nice to view news and weather in our neck of the woods…. not just about the best steak sandwich in Seattle. With so many channels how do you figure out which ones are the best to watch for quality local news and events. Pioneer Public Television is a regional public television station serving southwest and west central Minnesota, northwestern Iowa, eastern South Dakota and southeastern North Dakota. Pioneer is based in Appleton, Minnesota and operates transmitters in western Minnesota: KWCM-Appleton (Channel 10), KSMN-Worthington (Channel 20), and K49FA-Fergus Falls (Channel 49). Pioneer Public Television is a member of PBS, and is operated by the nonprofit West Central Minnesota Educational Television Company. Pioneer Public Television programs offer a blend of quality national and local shows with unique indigenous productions, reaching more than 100,000 households. Pioneer works hard to keep programs educational, entertaining and stimulating. The Mobile Studio is capable of recording concerts, town meetings, plays and sporting events with as many as seven digital cameras that can be linked to the trailer with fiber optic cable. A full video directing suite and separate audio suite are set up inside the climate controlled and soundproofed trailer. The Mobile Studio exterior wrap features photographs from around the Pioneer Public TV region, including images taken by local photographers Kristi Fernholz and Rob Rakow. Mobile Studio to capture live music concerts from greater Minnesota and beyond in a new 13-episode series. The show will appeal to viewers from small towns, farms and cities across the Heart of the Upper Midwest. Pioneer has used the mobile studio to record episodes of Funtime Polka at the Larry Olsen Farm in Lake Benton and a series of performances at the Minnesota Old Time Music and Bluegrass Festival near Richmond, Minnesota. Currently, Pioneer Public TV is seeking input from members and nonprofit partners from within the viewing area events that could be documented through the Mobile Studio. For more information or to propose a use for the Mobile Studio, email the station at yourtv@pioneer.org. The PBS WARN project provides a satellite-based backup to any cellular carrier that participates in sending geo targeted Wireless Emergency Alert messages from FEMA to their subscribers. Transmitting across 367 stations in all states and territories, the PBS distribution of the Wireless Emergency Alert messages will reach virtually any cellular network operations center in the country. PBS WARN is the channel of last resort. When even the internet is down, PBS stations can help keep their communities informed with an alternative pathway for this critical next generation of emergency alerts. Because of the WARN program, cellular operators that could not otherwise be able to add redundancy to their operations will be able to keep their subscribers as well informed as if they had their own satellite backup system. The WARN project is funded by a Department of Commerce grant through the National Telecommunications and Information Administration (NTIA). Individual contributions are Pioneer’s single most important form of funding. Members provide the foundation necessary for us to receive matching dollars available to us from state and federal levels. Without individual support first, access to state and federal funds would be limited. Individual contributions are matched dollar for dollar to receive the maximum amount of state money available, then, together, along with corporate support contributions are used to match federal grants. Nearly 60 percent of our budget comes from people just like you — our members. Unlike network television, cable or other corporations, we are a nonprofit and we rely on your support to provide great programming that you’ve come to expect from Pioneer. We care a great deal about the use of contributed dollars. That’s why we work very hard to see that the greatest possible portion of each dollar received goes toward the wonderful programs you see. Your financial gift to Pioneer Public Television not only helps us provide quality, educational programs, but your investment in Pioneer Public TV reinforces the values for which public television stands. Additionally, we pass on a variety of benefits to you. Every member of Pioneer Public Television receives our Pioneer Preview. Add to that, when you make a gift of $25 or more, you can sign up your children or grandchildren for our birthday club. PBS Kids is the number one educational media brand according to a national Roper Study. Over 75 percent of our annual budget goes directly toward purchasing, producing, broadcasting and keeping you informed about our programs. MVTV Wireless is proud to not only carry the Pioneer Public TV channels on our Digital TV line up, we are also members and advocates of all the wonderful programming PPT provides in our area.